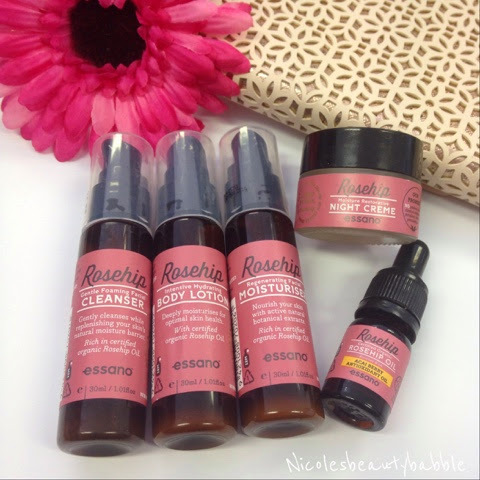 The pack contains five mini products from the Essano Rosehip range, 1x Certified Organic Rosehip Oil 3mL, 1x Gentle Foaming Facial Cleanser 30mL, 1x Regenerating Facial Moisturiser 30mL 1x Moisture Restorative Night Creme 10g and 1x Intensive Hydrating Body Lotion 30mL. I have been trying all these products over the last month and have been loving them, I still have a fair amount of product left as you only need to use a little bit of each product. The products do not irritate my skin but leave it feeling great. The rosehip oil I have been using at night before the night creme and it just sinks into my skin and with the night creme on top it just leaves my skin so moisturised and feeling clean. The Facial moisturiser is not oily at all and sinks in beautifully, The facial cleanser is like a normal foaming cleanser and the body lotion I have really been loving I use this on my hands and arms its not oily so its great to take with you to use at work or on the go as it just sinks into your skin and has a nice very light scent. This entire range has been fantastic I have been loving everything and the pack is so convenient for travel or to take your products in your hand bag. If you have been looking at this range but were unsure I highly suggest you pick up one of these packs and give it ago you will not be disappointed. Have you tried or going to try this range? I picked up this set recently and have been loving it! This will not just help you to stay looking young, but it will also help you to keep any facial blemishes from happening.